I’m slowly but surely recovering from my major break out from last autumn —yes, the aftermath is still here. My skin is almost free from blemishes, but that leaves those very annoying hyper pigmentation spots. In the hope to vanish those, Antipodes Apostle has been on my radar. A skin brightening and tone correcting serum with Manuka honey. To make it sound even better, it’s natural and certified organic. What a treat. Because of the before-mentioned hyper pigmentation spots, I’m kind of ‘forced’ to use medium coverage foundations or light-medium bases with yonks of concealer. And this is when NARS Sheer Glow steps in. I recently found a sample of it in one of my drawers and it instantly reminded me of the good ‘ol days and how much I liked it. One way or another this one will find its way into my make up stash. It’s either this big boy or Chanel Perfection Lumiere Velvet. Another make up offering has caught my eye, simply because it’s Dior and the packaging is gorgeous. I’m a huge fan of liquid lipsticks as they mostly are so long lasting and wear off as a stain. Dior Fluid Stick comes in a wide range of shades and the one’s I’m eyeing are Vie d’Enfer, Aventure and Magique. I love my cleansers, especially anything with “balm” labelled on it. de Mamiel Restorative Cleansing Balm comes in a big tub and although the exterior isn’t something I’d get excited about, the inside is what is making my heart skip a beat. Packed with a blend of beautiful natural and organic oils and ingredients, it’s this close to be mine. The only thing stopping me? The rather hefty price tag… Oh, the prices we pay for good skin. 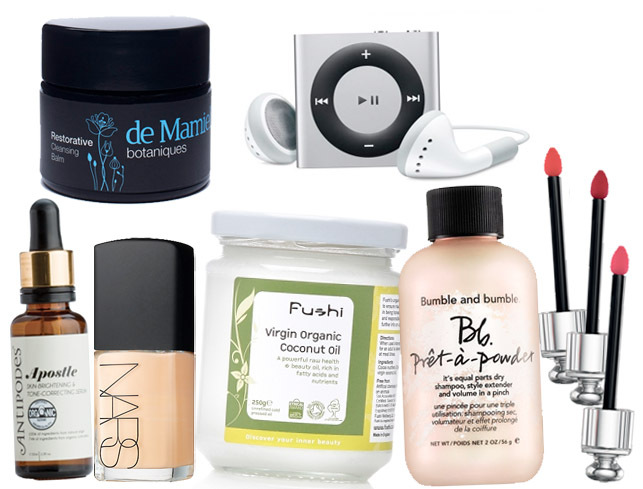 Something a bit out of its element between all these beauty bits is the iPod Shuffle. You know I do love my tech and this tiny chunk of aluminum has been in my basket for quite sometime. It’s just the perfect size and weight to take with me when I hit the gym or go for a run. With the clip it’s much easier to carry around compared to my iPhone 5. And hey, I still have got some birthday money left. Hide your purses, y’all.